Program Description: The Dartmouth Institute for Health Policy and Clinical Practice (TDI) at Dartmouth offers three graduate degree programs: a Master of Science (M.S. ), a Master of Public Health (M.P.H.) and a Doctor of Philosophy (Ph.D.). The overarching educational goal of the graduate degree programs is to prepare leaders in the measurement, organization, and improvement of health and health care. Both Masters degree programs build upon a rigorous core curriculum that provides an understanding of the challenges facing the U.S. health care system and a firm grounding in the skills required to evaluate and improve public health and health care. Students will receive a foundation in epidemiology and biostatistics, outcomes research, health decision making, health economics, and health care improvement. Students enter this program with a wide range of academic backgrounds with majors including, English, Economics, Psychology, History, Math, Geography, Sociology, Biology, Chemistry, and a host of others. The Ph.D. program goes beyond the Masters degree by offering in-depth, multi-disciplinary training in the conduct of research and teaching in the areas of special expertise at The Dartmouth Institute. 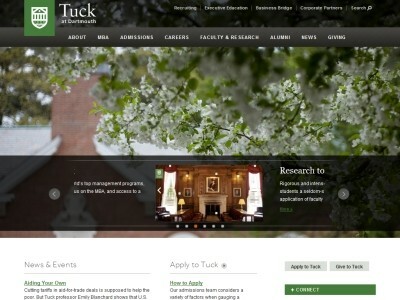 Joint programs with the Tuck School of Business and Dartmouth Medical School are also offered.PH. Accreditation: MPH Program is accredited by the Council on Education for Public Health. # of Credits Required: 56 International Student Requirements: No scholarships or stipends are available for international students.